Offering an exemplary itinerary that’s nothing short of magical, the Peninsula Chicago's exclusive “Keys to the City” program is packed with some of the toddlin’ town’s most quintessential sights, sounds and tastes, providing guests with VIP access to incredible only-in-Chicago activities. On a recent visit to the Windy City, we were able to take advantage of much that was on offer, finding ourselves — figuratively speaking — blown away by the experience. A view from a bathroom inside an executive suite at The Peninsula Chicago. Upon arrival at the Peninsula, my wife, Jen, and I received a behind-the-scenes peek at the hotel’s newly updated, high-tech guest rooms courtesy of director of public relations, Susan Ellefson. Gone are the warm yellows and oranges of the 1990s, replaced by a contemporary, soothing palette of blues and greys that manage to evoke a sense of tranquility even in the heart of the busy, jostling Magnificent Mile. With spectacular views of Michigan Avenue and the lake, our corner suite also offered wonderful vistas to the north and south. Our first order of business (or should I say pleasure?) was a lovely al fresco lunch at the Peninsula's Pierrot Gourmet. This cozy European-style café and bistro offers a taste of Paris with a warm farmhouse-inspired vibe featuring rustic wood panels and wrought-iron accents. 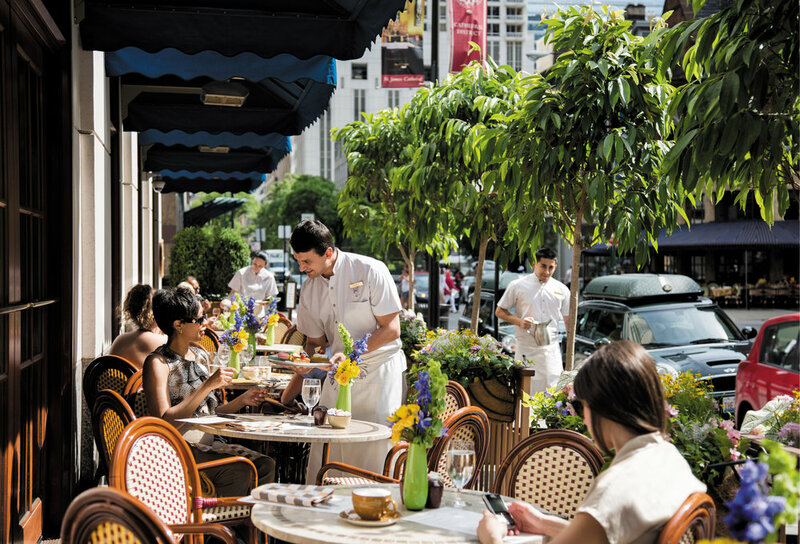 Outside, tables surrounded by colorful flowers face out onto bustling Rush Street. We enjoyed house-made charcuterie and salads, an icy rosé providing the perfect foil for a steamy, sunny day with temperatures in the mid-80s. Next, it was all aboard for a little sightseeing by way of a 90-minute Chicago Architectural Foundation River Cruise on First Lady Cruises. The boat tour up and down the Chicago River sheds an unexpectedly fresh light on the city’s soaring skyline, along with stunning views of landmark skyscrapers and iconic buildings like Marina City, the Wrigley Building and Tribune Tower. Back to the hotel for a quick shower, then on to the PrivateBank Theatre, where we enjoyed orchestra center seats (purchased through the Keys to the City program) for a performance of Hamilton, one of the Broadway In Chicago series season highlights. What can I say about Hamilton that hasn't already been said? It absolutely lived up to the praise, and to our expectations. Easily one of the most romantic dining venues in town, the Peninsula’s elegant Lobby spoiled Jen and me for the foreseeable future. Believing that breakfast is the most important meal of the day — well, until lunch anyway, we fueled up for our morning constitutional with several selections from the prix-fixe menu. Jen opted for proteins with a classic combo of eggs, bacon and sausage, while I went with the spa breakfast of yogurt, muffin and berries. Seated at a table next to soaring 20-foot windows overlooking the terrace, we reveled in the opulent ambiance that begets luxurious leisurely meals. The Lobby restaurant is also open for one of Chicago’s best afternoon teas, featuring traditional cucumber sandwiches, scones, cakes and a vast array of interesting, unusual tea choices. To keep the glow going, we spent the next few hours simply strolling and shopping, ducking into the Merchandise Mart in search of inspiration for some renovation projects we’re working on back home before retreating to the hotel for another French-leaning lunch of quiche and pinot blanc at Pierrot Gourmet. A leisurely walk along the lakefront was a perfect way to pass the breezy, warm afternoon. On a hotter day, we might have preferred a visit to the well-appointed Peninsula fitness center, pool and spa on the 19thand 20thfloors where, after a workout with a view, you can pamper yourself with a bamboo massage, pedicure or an ultimate facial. The Lobby’s signature burger, and a bottle of equally succulent Côtes du Rhône, proved a satisfying choice for dinner, preceded by a dozen sweet little oysters from the Pacific Northwest. After a relaxing single malt at the restaurant’s supremely well-stocked bar, it was time for bed and a long, deep sleep. Chocolate, of course, is an essential element of any romantic getaway, and our Peninsula package paid ample attention to this detail with a private tour and tasting at Vosges Haut-Chocolat, where we were educated about the “correct” way to taste exotic chocolate. Let’s just say I appreciated the meditative deep breathing aspects involved in proper tasting techniques more than Jen did, although we both swooned over the divine exotic truffles, especially the absinthe and banana pudding flavors.These intriguing chocolate creations are made of only the finest ingredients sourced from around the world by founder and chocolatier, Katrina Markoff. This special tour, again exclusive to Peninsula guests, provides an extraordinary sensory experience. Furniture shopping in Lincoln Park whetted our appetite for a superb dinner that night — a multi-course parade of stunning dim sum at the Peninsula’s sleek Shanghai Terrace. A succession of small dishes usually eaten at lunch and teatime, our dim sum meal lasted well into the night, leaving us both tired and hugely satisfied. Steamed dumplings, potstickers, seafood and an entire Peking duck served with all the traditional accoutrements made a procession to our table during the course of the evening. Fabulous unfiltered sake, just slightly sweet, offered the perfect accompaniment. As was quite obvious throughout our visit, service is king at the Peninsula. From management to housekeeping, the entire staff goes well out of its way to ensure utter and ultimate guest comfort. Between its forward-thinking accommodations and the Keys to the City programming, the Peninsula offers the ultimate Chicago experience, whether you’re a first-time visitor or a seasoned traveler. Although Jen and I fall into the latter category, we were delighted to make many new discoveries during the course of our stay. I’ll never look at a chunk of chocolate the same way again. For more information, visit chicago.peninsula.com.